Giant-Size Geek: Legion of Three Worlds 3: Best Return From the Dead Ever! Legion of Three Worlds 3: Best Return From the Dead Ever! I knew this was coming ever since the Lightning Saga ended. 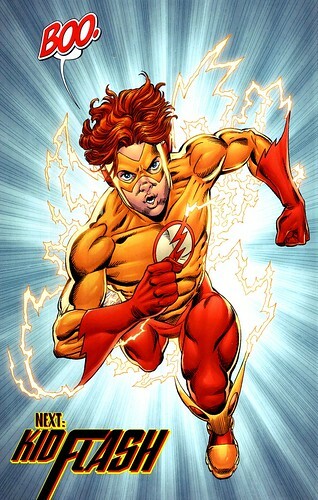 C'mon, Geoff Johns wasn't going to let Bart Allen die! Besides being back from the dead, notice that he's a youthful Kid Flash, once again. Goodbye instant adulthood! Thank you, Geoff Johns, for rectifying that awful mistake, which I blame totally on Dan Didio. Nuff said.